Proper cutting requires a sharp blade and a cutting mat. These sets are perfect for designers, scrapbookers, calligraphers or anyone who crops a lot of photos. Protect your work surface from sharp blades, writing instruments and other art and craft tools. Cut paper, film, textiles and more. 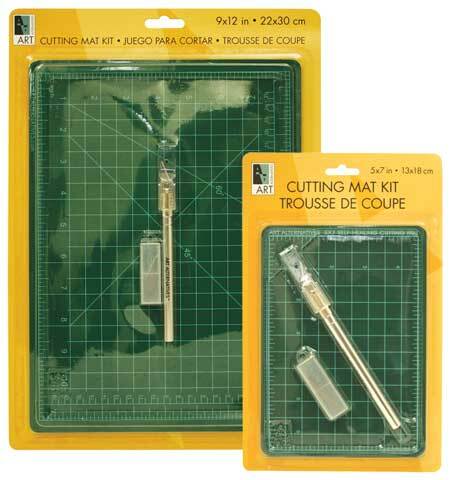 The cutting mat's resilient surface heals so completely that cutting leaves no visible trace. The mat is 3mm thick featuring 5-layer PVC construction. Its non-slip, non-glare surface is printed with a 1/2" grid with 1/8" marks for precise alignment. The mat won't break down with repeated use and actually prolongs the life of the knife blade. You can even use both sides. The Aluminum Art Knife features a safety cap and comes with three replacement blades (4 blades in all).